John Foster helps to prop up historic houses by uncovering valuable heirlooms that the families can sell. The trustees left in charge of a decaying mansion need help. Browse content similar to The Haining. Check below for episodes and series from the same categories and more! Break my heart to see those go. He's had 20 years as a fine arts and antiques specialist. At the front row, all done at 15,000. All done. these treasured properties a lifeline. to take the difficult decisions necessary to save it? It's a bit like a bereavement. to make sure it's maintained. 30 miles south of Edinburgh in the Scottish Borders. to entertain famous guests like Sir Walter Scott. But now, it's on the Buildings at Risk Register. died three years ago without an heir. to use for architectural, cultural or historical benefit. who set up The Haining Trust. It is just a constant money pit. We have to keep it wind and weather-tight, and it eats money. You can see the corrosion on the walls here. that it wasn't enough for us to do what he wanted. We were very close. I suppose we lived a bit in the past. Miss Pringle-Pattison has very fond memories of The Haining. and your cousins and all the rest of them. This was a great kind of meeting place for everybody. Miss Pringle-Pattison doesn't want to make. they need to turn this historic house into a viable business. I'm fascinated by the story of The Haining. And now I'm actually going to see it. I can't wait now to get inside. Straightaway, you can see it's been pretty neglected. remodelled The Haining in 1821 as a Palladian villa. Nice to meet you. And this is Miss Pringle-Pattison. Hello, nice to meet you. John Foster. So, you're the ladies left in charge? Yes, we are finding it quite daunting, but quite a challenge. And how long have you known the house? It belonged to my grandparents. I first came here when I was between four and five. -and just spent our holidays here. -I can't wait to get started. That's a great room, isn't it? There's lots to look at, which is a good start. There really is. -And who's the piano player? -My cousin, Andrew Nimmo Smith. the use of his right hand - but that didn't stop him listening to music. Obviously, musical and well read, judging by the books. -Yes, he enjoyed his books. -I can see quite a run of Punch, there. he as a solicitor, so they're all there. Andrew Nimmo Smith was descended from the Pringle clan. for centuries and have lived on the Haining estate since 1701. I mean, it's really not the typical Scottish house I was expecting. with that ceiling light up there. of everything being perfect and symmetrical. another detail, and such beautiful quality. and actually some really quite high quality. I mean, this bust of Napoleon is about as fine as you get. Can't see any signature on it. But whoever carved this really knew their stuff. That's Charles Oppenheimer. And he's a very good artist. in the famous See Britain By Rail poster campaign. And Mr Nimmo Smith collected other well-known Scottish artists, too. because there's been quite a few of them around the house. but he also bought large job lots at auction, which soon filled the house. This really is a mess. to Miss Pringle-Pattison and her cousin in Mr Nimmo Smith's will. It's understood they have gifted it all to the trust. any really important family items. Goodness me. I think I knew he was a hoarder, but not to this extent. You get the odd letter - well, there's a letter. Actually, it's a letter to me. How funny. This is all about cats. He was very keen on cats. Mostly rescue cats. but so far I haven't. But John might have found a treasure. late 18th, early 19th-century Italian marble. and said, "I need to make this hall table or this marble slab usable,"
and almost quite Scottish in style. This really is a good-looking clock. the case would fit exactly to the movement, and this one doesn't. Mr Nimmo Smith, like his father, was with the Royal Scots Regiment. and you can almost imagine when the last time that was put on there. -I've just found all these albums. -Can you take all those? -They start with that one. This one is 1921. At The Haining. -It's amazing to see the house, isn't it? that little boy sat there on the step. It seems a very social house in these photographs. because the previous lot had been very close. Yes, I suppose we lived a bit in the past. That must have been after the war - you can see the damage to his hand. What happened to his hand, then? and straight into the next man, and killed that man. -So, in a way, he was terribly, terribly lucky. in trust to the community really upset her. I think, actually, I cried. Was it just the realisation that it was all over, or...? and nosing around, that kind of thing. So you wanted it still kept private? Yes, I still do, but it can't be. But you've got to come to terms with this. I wished he could have talked about it before. I don't know when he got the idea. make business decisions to try to protect the house for the future. But we've also had drainage problems. And I found out this week it's going to be £10,000 to fix it. And whilst we're at it, we need to bring in a water main. to run this house for the future. by hiring it out for events. But that will require investment. This is the room that we're hoping to make into the catering kitchen. the finances are concerned, because we're having to hire in kitchens. you're really having to charge over the odds. by re-doing this room to a commercial standard? -Have you started getting quotes and things? is going to be in excess of £25,000. So, fingers crossed we can raise the money somehow to do it. I don't know how we're going to make this house wash its face. The catering kitchen is just a start. the total funds needed to £100,000. an auction where it's devoted purely to the contents of the house. it has an incredible history, and people really want a slice of this. because at the auction, we need to maximise every penny. John needs to get the ball rolling. Oh, he's heavier than he looks. ..because he thinks he can find a private buyer for it. Susan has more than just the house to worry about. Until the job is finished, the scheme can't generate income. two of which are holiday lets. They could all bring in cash if they were renovated. and therefore it's going to require a lot of money spent on it. The windows look fantastic, but nearly all of them let in rain. and this is constant. It's constant. John has brought the bust to London. he wants to give him a bit of a facelift. for Buckingham Palace, so Napoleon should be pretty straightforward. an item like this, because otherwise it would look new. -I'm so excited to see how it looks. What I have here is a mild soap solution. Start always on the back, and just clean. -As you do that, you start working. -You see the dirt popping out of it. Yes, you can, yes, you can. Here you can see where the craftsman has been. You can see the chisel marks, you can see the rasp working away. And that is a wonderful thing to see. compared to the life of an item like this. -So really, we're only the carers. -He really does come up, doesn't he? -You can see, look. It's glowing. so he will leave Wagner to finish the facial. -Very nice to meet you. Well! The Haining and appraise the contents of the house for auction. I think he's probably one of ours as well. And the bowler hat. Oh, that's shame, I wanted to sell that! I remember Mr Nimmo Smith wearing it, so I would quite like to keep it. Mr Nimmo Smith's collection is. combined with 19th-century oak cupboards full of car batteries. Mr Nimmo Smith's taste was certainly eclectic. and you've got a beautiful George III mahogany longcase clock. most of them items in here are going to sell themselves, as we say. and hammer out a deal on the all-important commission rate. if you had to give an estimate for the contents? to touching 90 to £100,000. Can we not hold you to that, no?! -Well, I would love to guarantee it, but an auction is an auction. so I'm quite encouraged by the fact. I put it somewhere 50 to £70,000 as a bottom estimate for the sale. I like his one better! -I like his one better! and the quality of the items on that commission? our trade rates of 10%, I think, could be on the table. You've done very well there. I do like this chap! And I do like the offer. That sounds a lot more reasonable, in fact. they can afford to keep. They're keen to show John one item in particular. and Miss Pringle-Pattison's uncle, Francis Nimmo Smith. This is the most poignant book I think I've ever come across. Some of it is absolutely wonderful. "and seems to drive them out of their minds. "especially badly, several men being literally blown to pieces. "The whole earth shakes with the explosion. "They'd not been specially weak, but just average, hardy men. "The explosion had torn the clothes off some of them." that people wrote down their experiences. What is uncommon is to have them in this kind of depth. Whereas a lot of the diaries are just diaries. But he brings in his own comments about it. You would have to really wrestle me to the ground to get those to sell. We really will be in trouble if we have to do that. the catering kitchen has to go, because I'm not going to sell. without having to part with it. But he wants to do some research before sharing his idea. Susan urgently needs The Haining to earn its keep as a venue for events. to celebrate the Queen's Jubilee. So, there'd be 12 of them and they're £30 each? I think we'll do it. but a fairly crucial detail has been omitted. that was meant to be in it, which was quite important - it was the date. luxury picnics from a hotel, at a cost of up to £40 per head. People haven't ordered picnics that we had hoped would be ordered by now. She previously staged a successful Easter event that attracted 1,000 people. They were all given a leaflet to tell them about this event. Susan hopes that some of them will share her passion for the 1950s. to throw cocktail shakers about the place, et cetera. to make you look like Marilyn Monroe, or somebody of that nature. if the turnout is good tomorrow. If it doesn't happen tomorrow, we are going to have egg on our face. of wartime diaries and letters in the world. to earn them some money. Richard, I found this diary fascinating. I know you've read hundreds of diaries. -Did you find them interesting? -I really didn't know what to expect. diaries vary very much in quality. This is an excellent diary. Brilliant. What was it you liked about them? It's the detail, you know? he talks about how men were blown apart. I knew about that, but what I didn't realise was that it was this kind of suction. He talks about men being sucked down into the shell hole. He talks about how others were drawn down. "Drawn down into the holes by a sort of suction." and he does that time and time again. you think, gosh, that's really expanded my knowledge of the Great War. who was waiting for him at The Haining. it makes me wonder what was going on in his mind. Why would they write these diaries? and I just don't know what her reaction would have been to that. because Francis proposed as soon as he returned from the trenches. Clearly, you think this isn't a run-of-the-mill diary. Where do we go from here? What would you do with it? If I could, I'd take it home with me right now! as I know other historians would, too. I think The Haining could publish this, I think it would sell a lot of copies. It's just a great read. which could end up here at the Imperial War Museum. And not only that, it could actually make money for The Haining. All in all, such an exciting find. home of the bannock cake and 5,500 people. The locals are getting into the Jubilee spirit. But will they come along to support Susan's event today at The Haining? Having invested £6,000 in it, ticket sales need to top the 800 mark. Susan takes advantage of the make-up artist she has hired. I feel a bit like Minnie Mouse. of hundreds of thirsty guests. The gates opened at 2pm to attract families and people with picnics. but I haven't quite lost heart yet. Tickets are available at the gate, but they haven't had many takers. I would say 20 to 30. So it's been fairly steady, but fairly quiet. It's very cold here today. It's only about nine degrees. or outdoor marquees, et cetera. But Susan's parents have come, with her husband, to see the event. Susan resorts to portable heaters to warm the marquee up. and the loss of £6,000 that she desperately needs. I wish there were more people here. I wish it had worked. and if people won't support something like this, we've learnt something. that should cheer Susan up. and they're really interested in it. And the figure we're looking at is 5,000. -That would be good, wouldn't it? And you would get more than if it went in to auction. Would you advise that we do that, then? I like the idea of him going somewhere nice. I think he'd have a jolly time there. that you found, and they were really excited by it. very interested in actually publishing the book. You know, and have a steady stream of income coming in. -That would be great. It really would. but Susan still has to deal with the fallout from the Jubilee event. She sits down with the volunteers who help out at The Haining. which, as we all know, was a disaster. The Jubilee wasn't advertised nearly in time, was it? -It was a week to go. Wasn't good enough. I think that's right. The residents of Selkirk seem to agree. Well, I'm not sure that they've got it quite right. It sounds like they might be rushing on without thinking it through. to be entering the grounds and property. I just find that very strange. and turn them into positives. throughout the whole of the Borders, and further afield. I think that's what we have to start with. to be impressed by the fresh-faced Napoleon that Wagner has created. I'm at the exclusive Eight Club in London. who wants to buy the bust for one of his smart interiors. Second-guessing what a client might be tempted by is the key to selling privately. and really wants George to like the bust. Come and see what you think, George. I've been dying to show it to you. We had it cleaned, because I know how fussy you are. and it's come up way better than I thought. You have done a fantastic job. It's really fantastic, it's really striking. I really like it. I'm not surprised you like it, cos it's come up brilliantly. And you think it will be here rather than the club in Paris? I think, yes, let's go for it here. Let's leave it here in all its glory. I'm really pleased, John. Thank you. Well done. I'm delighted that the club has agreed to buy the bust for £5,000. Susan and Miss Pringle-Pattison will be really pleased. Back at The Haining, urgent window repairs are being carried out. of the Jubilee event behind. to the business of the Jubilee. It says that The Haining House could go down the tubes. "in Selkirk to the people of the town following his death." The house wasn't left to the people of Selkirk. and Mr Nimmo-Smith was a lawyer. involved since we started, and we've had a lot of volunteers. That's why this is... It feels like a personal attack. and facelift of the interior feels more important than ever. The auction house have come back to catalogue the contents of the house. and I'll catch up with you quite soon? John is also keen to highlight items that will attract bidders. That's quite nice. NS for Nimmo-Smith. That's actually silver, which is good. which you only get on silver. That's actually quite fun, that. for carving your piece of Sunday roast? and two, there's probably seven, £800 worth of repolishing. and once it was locked in place, that was it, no more. The whisky will remain under lock and key until there's something to celebrate after the sale. to get his opinion on the paintings. the slightly battered portraits in the hall. They're quite good, actually, they really are. it must be a Scot, I suppose - what could have done 'em. There are nearly a dozen pictures in the house by Tom Scott. and he lived all his life in Selkirk. His pictures are terribly pretty. they're going to add up to maybe as much as £10,000. So, what on earth has happened here? but he wasn't that keen on his grandmother. -She was rather a stern old lady, I'm told. have been restored, but this one has a problem. -Poor thing, she's being eaten alive! I think you'd better ask Porton Down for an opinion! Yes, I think so too, it does look a bit...! Rupert has also spotted the painting that John singled out. There's a picture over here which I think is really cool. And not just because it's a snow scene. I really like this. especially the backs of the houses. And here we have a classic Charles Oppenheimer, therefore. I've sold one Oppenheimer which was the back of buildings before. Yes, that's what he did, that's his shtick, if you like. -Would that have a good value at auction? Gosh, as much as that? That's tremendous, that's really good news. it wouldn't surprise me to see it doing better. Does it feel weird, seeing it go? Yes, in a way, because Andrew loved that one. It's just a blank wall. There's going to be quite a few blank walls. It's usually quite a shock. they don't realise how empty it suddenly looks. -It's the start of the beginning of it, isn't it? to support The Haining for the future. I just want it to get really going. But one painting that might not be going is the portrait in the hall. Rupert's appraisal has made John curious about the sitter. It's a good-looking painting, isn't it? do you know who it is? Miss Pringle-Pattison doesn't know which one. -If he's linked, then that's good. sometimes a name. Shall we take it down? Sometimes there'll be a name. Or even a regiment would help. Can you tell sometimes from the regiment? Well, I can tell that it's had a lot of damp. Someone obviously didn't like him, cos they've stabbed him through the chest at some point. -But, I mean, John Pringle, son of Mark Pringle, it looks like. That doesn't mean anything to me, but maybe we could check and find out. He might be the Pringle that built it. -but if he's a lesser Pringle, this goes for sale! -But really, he just needs to go to a restorer. I think, unfortunately, the whole house needs to go to a restorer. But, you know, he's great. to see if he can find out who John Pringle was. John Pringle succeeded his father Mark as a minor in 1812.
and then joined the military. to really stamp his mark on the house. of the house that he planned to build. -Right, but not quite how it looks, is it? He only ever built the middle section. His flamboyant dress sense and wild parties caused tongues to wag. Sir Walter Scott, who referred to him as the disconsolate dandy. -Wow, Walter Scott of Ivanhoe fame? That's pretty impressive. He had his court house in Selkirk. Sir Walter Scott is from this area, and he knew John Pringle. the portrait of John Pringle should stay at The Haining. her next foray into the world of events - a pop-up restaurant. Disconsolate Dandy. Isn't that wonderful! We will make Granny smile yet, I think. a successful outcome for Susan this time. "I need to have a dinner party, I need to have a wedding." for the company doing the pop-up restaurant. and not having to spend that kind of money. The event company seems sceptical that Susan can pull this off. in a place where there's essentially no functioning kitchen is madness. the Haining sale catalogues are back from the printers. The pop-up restaurant team have been battling in the kitchen. to oversee proceedings, and the guests are due to arrive any minute. Here we go, we have guests! the Haining experience be worth the £86 per head that they have all paid? -I heard the term "faded grandeur". -But no, a lot of character so far, definitely. The chefs have come up with the goods using the hired equipment. And the guests are enjoying the menu. But the surroundings could be better. so hopefully it will get that now. But has this event raised any money for the refurbishment? This one isn't going to make money this time. We will make a small loss, very small loss on this one. We're speaking about very much less than £1,000. But we're trying all these events to see what's going to work. and the happy customers are driven back to Edinburgh. some bad news that could undermine all of their plans. and that was certainly our understanding. Well, that's what I understood. of the value of the contents when they're sold at auction. But you're saying there's a half share not coming? Unfortunately... I'm saying we're only getting half the money. -That is a major blow. You must have been crushed when you found out. It has been a very difficult week for the Trust. and very upset by this at the 11th hour. -For Miss Pringle-Pattison, it's particularly difficult. It was an awful shock, I really am surprised about it. so this is so unexpected. -to get the thing going. to start clearing the house in preparation for the sale in Glasgow. prized collection of antiques is carefully packed and removed. a past from the house. I could be doing something that's going to completely ruin things. I don't know. I'm doing what I think is right. Feels a bit strange to see them going away. We just have to hope that we get the money that we need. The contents of the Haining have been unpacked in Glasgow, and interest in the sale is building. with people viewing things and taking things down. It's exactly what you want to see. As an auctioneer, it just settles your nerves before the sale. it hasn't been exposed to major sunlight or anything. The auction is attracting interest from as far afield as New Zealand and Japan. Ten, 20 years ago, you had to come to an auction to view the items. all of the problems that the item has. they can bid away, and they could be in Australia. Susan has arrived, and is anxious for a good turnout. Are there lots of people? Yes, lots of people, it's been busy, they're rowing it out. the Haining connection has attracted crowds. the 25,000 she needs for the catering kitchen. and welcome to the Haining auction. with a collection of 11 waterline model cruise liners there. -There's much interest in these. -I need these to do well. in the hope on attracting bidders. £130, we'll open the bidding on the lot, there. -500 bid. 600. 700. 800. 900, if you wish. 1,000. 1,100. 1,200. Are you all finished at £1,200? -Look, do you think I got my estimate wrong, 50 to 80?! You can't always get it right! I think I can safely say I got that one wrong! Yes, you got that one a wee bit wrong! rosewood and floral marquetry table, there. 1,100 bid. 1,200? No, you're out now. 1,100 here. Are you all done now? Last chance again. 1,100.
but there are still over 200 lots to get through. Miss Pringle-Paterson didn't want to attend the sale. since her cousin's belongings were taken away. I don't think there are any ghosts, though. Oh, dear, this looks very sad. Oh, at least Grandmother's still there. Yes, I don't like this room very much now. the salvation of the house that he loved so much. His taste definitely seems to appeal to the bidders at the auction. OK, the early 19th-century console table, £800. -Any more? £2,000 on the telephone, 2,200 online. Nice surprise of the day! £7,400, all finished. That's 7,400. I must hurry you, 7,600 is bid now. OK, £7,800 with you, then. In the room at £7,800. All done? -Good man! Go and shake his hand! But will the Tom Scott pictures appeal as much to the bidders? OK, the first of ten Tom Scotts we have today. The Son of Selkirk, I believe he's known as. Tom Scott again. Once again at £500. Border landscape by Tom Scott. 550? 600. Two new bidders, three new bidders. Are you all done at 1,300? a great help towards The Haining's new life. I'm dying to see it all cleared and painted and in use again. Galleries, or just being used and having people around it. Yes, it would be nice to have it occupied again. We've had so many obstacles that now I'm all for it to go ahead. because it's got to go ahead, and I'm determined it will. and I think it will be a great place to come to. OK, let's go out on a high. at 14, The High Street in Kirkcudbright. -I've got a good feeling about it. -So, come in at £10,000. It's alright, let's stay calm. OK, we're starting at £5,000. -5,000 is not a good start. It's 5,500, who'll make it £6,000? It's all online at the moment. -Phew, OK. We'll get the bottom estimate. Do we see £11,000? We do. £12,000 is bid. £13,000. 14,000, will you? £15,000. 15,500, will you? 15,500. I thought you had that glint in your eye! The glint has dulled. OK, at £16,000, are we all done? -That's great, and Rupert was bang on. Means we've got a bit of adding up to do. The butterflies were there right till the very end. But it was good that we saw such a lot go for good money. Hmm. All in all, a good day. Yes, absolutely. So, home for a bottle of something, I think. I certainly think we've earned it. -Are you not going to ask me? -How much did we make?! I don't want to ask! I know, I need to know, but... Well, have you got the figure? and Miss Primrose-Pattison, so I'm really pleased with that. and I also think we can do some of the repairs. We've actually now got the funds to get started. I'm just going back to The Haining for one last look. But this is the blank canvas that they need. into a desirable arts events space for the public. And so what are your plans, what's the next step? exhibitions and anyone who wants to show their arty things. about weddings for the summer, in fact. It's really going to have a new lease of life. Oh, yes, I think it could be very busy. I hope it will be very busy. I hear the locals and even the press are a bit more on your side now? the opportunity to get involved. -Your help has been invaluable. And does this mean I get an invitation to your first event? -Absolutely, and you will also be a friend of The Haining. It's just being developed, and you will be number one. and its an inheritance I don't think they'd ever planned for. for this house, and I wish them all the luck here at The Haining. Next week, a 700-year-old family house is in crisis. This needs money now, not at some notional period in the future. Will the owners part with precious heirlooms to save it? -We've got to raise the money. 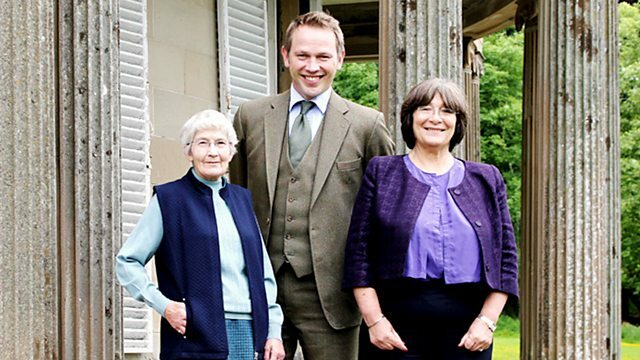 Antiques Roadshow regular John Foster helps to prop up struggling historic houses by uncovering valuable heirlooms that the families can sell. The trustees left in charge of the decaying mansion of an eccentric Scottish recluse need John's expert advice.